This 1916 Gothic-style station in Sandpoint, Idaho is the oldest remaining active passenger depot of the former Northern Pacific railway. Passengers still use the original white tiled waiting room before boarding Amtrak's Empire Builder to travel east to Chicago or west to Seattle or Portland. This is the only stop Amtrak makes in Idaho. The station, parking lot, platforms and track are currently owned by BNSF Railway. The station building was listed on the National Register of Historic Places in 1973 as the Sandpoint Burlington Northern Railway Station. The Northern Pacific was the first of the northern transcontinental railways, created by an Act of Congress signed by President Abraham Lincoln on July 2, 1864. The route was to follow closely the explorations of the Lewis and Clark Expedition of 1804 and allow for settlement of the northern territories between Lake Superior and the Pacific Ocean. Chinese and American workers constructed the road from opposite ends of the line until the last spike was driven on September 8, 1883 at Gold Creek, Montana. Not very long thereafter, on July 3, 1890, Idaho became a state. Railroads stood to make money from tourism, so they promoted the creation of National Parks and built hotels and lodges along their routes to lure tourists to see the beauty of the west from the comfort of their luxuriously-appointed trains. The Northern Pacific railroad promoted Yellowstone National Park as a destination even before it became our first National Park on March 1, 1872. Amtrak and the National Park Service have formed a partnership called Trails & Rails for the purpose of offering educational opportunities to Amtrak passengers about America's natural and cultural heritage, continuing the long association of railroads and National Parks. During the spring and summer months, National Park Service guides are onboard the Empire Builder between Seattle and Shelby, Montana. The Empire Builder's westbound train leaves the Sandpoint station just before midnight and arrives in Seattle or Portland late the next morning. The eastbound train departs Sandpoint in the wee hours and arrives in Glacier National Park the next morning. 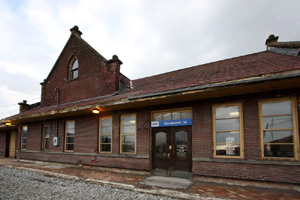 Visit the Amtrak website to see all the stations served by the Empire Builder route between Chicago and Seattle or Portland, and to purchase tickets online. In recent years, construction has taken place on both sides of the Sandpoint station — a row of condominiums on one side and a new highway on the other. 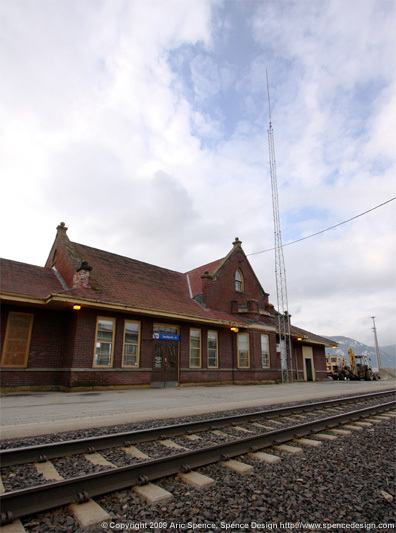 The station stands as an island of history between the signs of increased traffic and population growth in the picturesque town of Sandpoint, Idaho.